This medal brings back many memories of my first Adams Cup regatta, 1935, emblematic of the Women's National Sailing Championship. My next door neighbor, Ruth Sears had won the Adams Cup a number of times sailing against the great Lorna Whiltesey of the Indian Harbor Yacht Club which represented the ultimate in the sailing world to me. So it was exciting to compete in the championship. We, Katey Johnson, Frannie Williams and I, after winning the Mass Bay championship were invited to stay at the Indian Harbor Yacht Club in Greenwich, Conn. to participate in the Adams Cup and it was the "ultimate" of yatch clubs to stay in. Clifford Mallory was its Commodore at the time and also President of the North American Yacht Racing Union. The hospitality was exceptional and the crews were entertained with a welcoming banquet as well as an Awards Banquet which meant formal attire for both occasions. At this time I was also privileged to meet Mrs. Willis (Nan) Wood who was a trustee of the Adams Cup and instrumental in bringing women's sailing to national status and recognition by the North American Yacht Racing Union. After this I participated in more national sailing championships and eventually became a judge of sailboat racing which involved traveling all over the U.S. All in all it's been a great experience, making wonderful friends and seeing parts of the U.S. I never would have visited. So this medal (1934) led to many unforgettable times.
" We thought it fitting to have an introduction to the Adams Cup History by one of our past winners who is still actively involved in all aspects of women's sailing—from a member of the Adams Committee and its Board of Trustees to a Senior judge overseeing our sailing prowess. 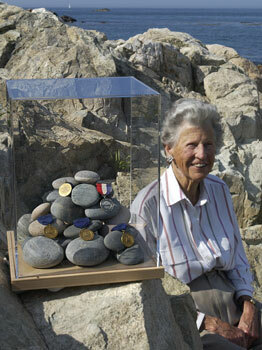 Frances McElwain Wakeman first competed in the Women's Championships in the mid-thirties, winning the coveted cup four times for her club of Cohasset, Massachusetts. Since then she has spent a great deal of time supporting the effort of all women sailors, encouraging them to compete, while championing their cause with firmness, fair play and great understanding—a fine example for the women racing from the thirties to today." © COPYRIGHT SUSAN MULLALLY 2017. ALL RIGHTS RESERVED.